Economically extend VGA video, stereo audio, and serial signals over CATx. Use ordinary CATx cable instead of expensive VGA cable to extend high-quality multimedia. 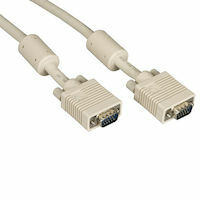 Transmits high-quality VGA plus audio and serial signals over standard UTP cabling. Features an icon-based GUI for easily managing the system. Use ordinary copper UTP cable to distribute analog RGB video to multiple screens with the MediaCento VX system. The extender sends eight channels of VGA video, stereo audio, and serial signals 492 feet (150 m) or 1000 feet (300 m), or more than 2000 feet (609.6 m) when the distribution chain includes the family's cascadable receiver repeaters. The transmitter and receivers install directly into an existing non-networked CATx infrastructure. There's no longer the need to pull new VGA cables to distribute video to distant monitors and displays. The system supports most common VGA resolutions, including WUXGA (1920 x 1200), Full HD (1920 x 1080), and UXGA (1600 x 1200) video on analog connectors, even at the longer distances. MediaCento VX features a unique, user-friendly graphical user interface (GUI) for managing all VGA screen connections. No more fiddling with complex commands. Not only can you use the GUI to enable or disable audio/video output simply by clicking on icons, but you can also put extender devices into groups for easier control of screen connections - great for managing broadcasting and command and control applications. The MediaCento VX system automatically detects and indicates the signal from the video source. You can independently turn on/off of video and audio ports. Simply add devices to a group that you'd like to control at the same time. You can also use the icon-based menu to easily add a transmitter to a connection pattern branch, set up and remove branches from a device, copy and paste a device branch to another device, apply settings to all extender devices, and more. For connection to a management computer, the MediaCento VX Single-Port Transmitter includes an RJ-11 cable and RJ-11/DB9 converter for connecting via RS-232. Long-range receivers feature advanced skew compensation, sharpness, and brightness controls, which make it easy to fine-tune the video image quality over longer CATx cable runs. A second VGA port and second 3.5-mm audio jack on the extender transmitter enable you to connect a local monitor and speakers. 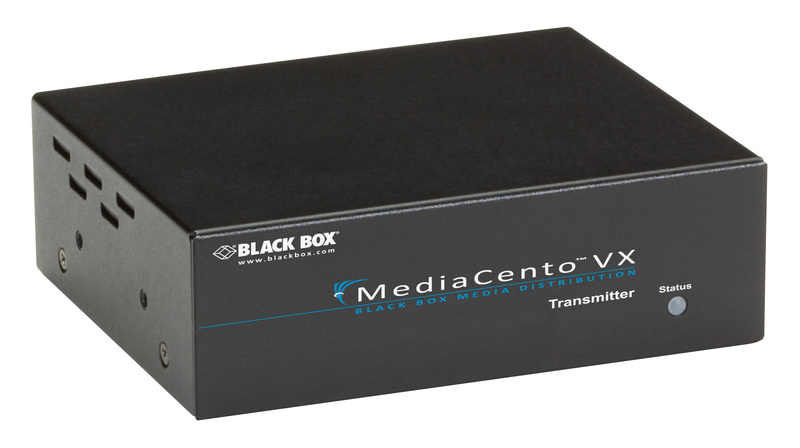 The MediaCento VX system features EDID copy function and is HDCP-compliant. Any digital signage application with VGA screens near CATx wallplates. Sending video to distant classroom monitors in schools. Sharing video with older VGA monitors in control rooms. Distributing legacy VGA video across a hospital campus. Extending corporate video to monitors in different rooms. Anywhere you need to quickly manage video output on groups of screens (government buildings, transit stations, malls, and retail stores). Want to expand to even more screens in a system? Order one or more of our cascadable, long-range receivers (see AVX-VGA-TP-CSRX). They can be linked via their RJ-45 ports to work as signal repeaters (with a maximum of four units in a chain) and/or be used to cascade via their VGA video ports to another transmitter. Depending on the transmitters and receivers ordered, the system supports as many as 32 threads and more than 1000 displays in a VGA distribution network. 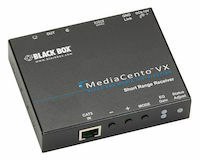 For details and help configuring your MediaCento VX setup, contact Black Box Tech Support. 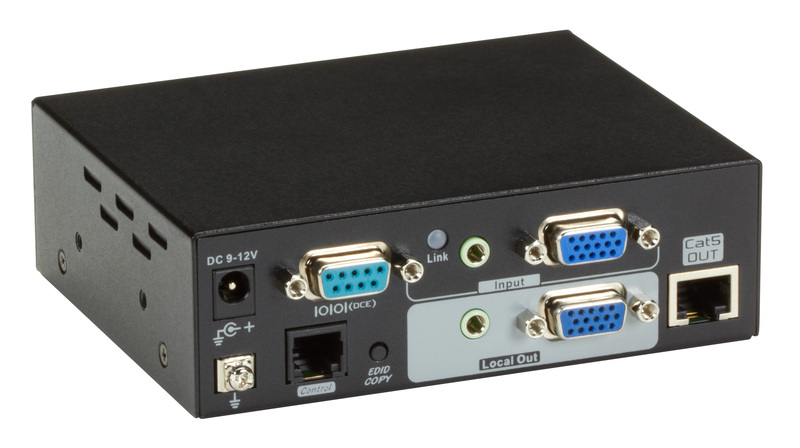 This unit does not support RS-232 out of local output. The MediaCento VX Single-Port Transmitter comes with a standard 3 Year Double Diamond™ Warranty (Standard) already included. VGA Video Cable with Ferrite Core - Male/Male, Beige, 10-ft.